ALVEOLITES GRAYI - SILURIAN DUDLEY. ALVEOLITES GRAYI - SILURIAN, DUDLEY. Alveolites grayi Edwards & Haime. 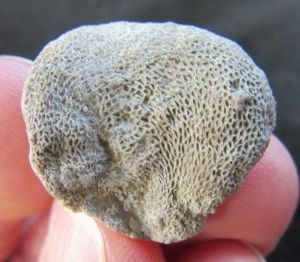 Small complete turbinate compound coral. Superb detail of the corallites under magnification. A little 'beauty'. Wren's Nest, Dudley, West Midlands. Specimen : 2.3 cm. diam.